Unisales is an application advertised by its vendors as a tool that will enhance online shopping quite a bit, as it should provide you with beneficial discount deals, promos and various coupons. It might sound as an extremely helpful program to have, unfortunately, Unisales will not do anything like that. In reality, Unisales is yet another adware application that will cause annoyance and frustration, to say the least. Even worse – it was noticed that this intrusive adware program might be used by other Internet-based infections as a gateway into your PC. It is not surprising that removal of Unisales is paramount, if you are keen on keeping your system safe and secure. Read the rest of this article and find out how this invasive infections functions and how it can be removed. The research has revealed that Unisales is very similar to adware applications such as RightCoupon, RealDeal, TicTacCoupon, LuckyCoupon and quite a few others. Just like most of its counterparts Unisales will flood your browser with numerous third-party commercial adverts and annoying pop-ups once it is up and running on your PC. These ads and pop-ups will be presented randomly whether you like it or not. Ironically, the application that should enhance your web browsing experience will only make it worse. The only way to restore the normal functionality of your browser is to completely remove Unisales as soon as it is discovered running on your system. Unfortunately, there is something much worse about Unisales and that is the potential danger that this invasive adware imposes onto your system. For instance, your system is at constant danger of getting infected with other Internet-based infections as Unisales is capable of updating itself. Often updates of such applications are executed automatically, thus the user is not entirely sure what has been downloaded onto his or hers system. Your system could get infected with unknown malware in this way. It is extremely dangerous and that is why Unisales should not be ignored. Remove this potentially malicious adware program without hesitation as it is the only way to ensure total security of your PC. Fortunately, the manual removal of Unisales is rather simple as you can delete it via Control Panel. It has to be noted that in some cases manual removal is not enough to remove every bit of Unisales. 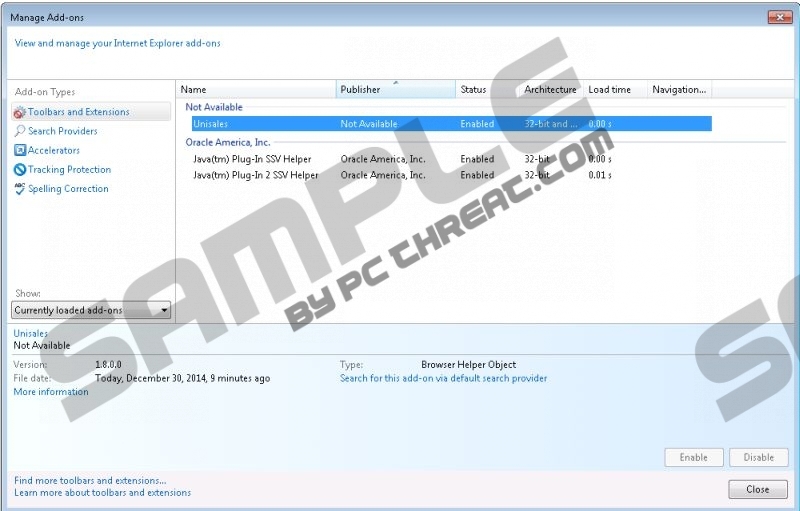 Some traces of this adware application could still be active on your PC. If they are not removed in time the malicious application could restore itself silently. If you wish to remove the infection entirely, please us a reliable antimalware tool. Double-click Unisales to remove it. Quick & tested solution for Unisales Ads removal.